We are preparing early for the 2016 Cross Timbers District Awards and Recognition Dinner. DISTRICT PHOTOGRAPHER until March of 2016. The objective is to collect and/or shoot photos of training events, OA events, various district committee meetings, Eagle Boards of Review, cub day camp, summer camp, unit special events, anniversary events, etc. that involve adults and youth from the Cross Timbers District during the coming year. The photographer will take photos and provide a repository to gather a digital collection of photos from others. The photos will be used to produce a Power Point presentation at the 2016 District Awards and Recognition Dinner. It's not every day you get to shoot 'em, tweak 'em, frame 'em and then hang 'em! If interested, please contact Kent Couch, XT District Vice Chairman, via email with your phone number at kent.couch@gmail.com. We need you! Thanks! Our next rated tournament is only two weeks away. Please pre-regsiter. We already have 14 pre-regsitrations with ratings from 200 - 1700. We will most likely add are reserve U1000 section, but allow any rating in the open. Please bring your tournament sets and clocks if you have them. We currently have only one section, but if enough people play, we will have a lower-rated reserve section. Invite your friends. We will not have our weekly meeting on April 30. 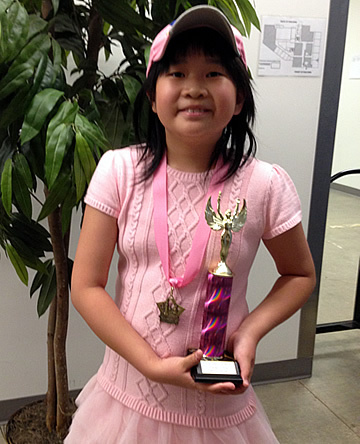 May 2 Plano Chess Club May Spectacular G/30;d0 - 3 Sections: U400, U900, 900+. 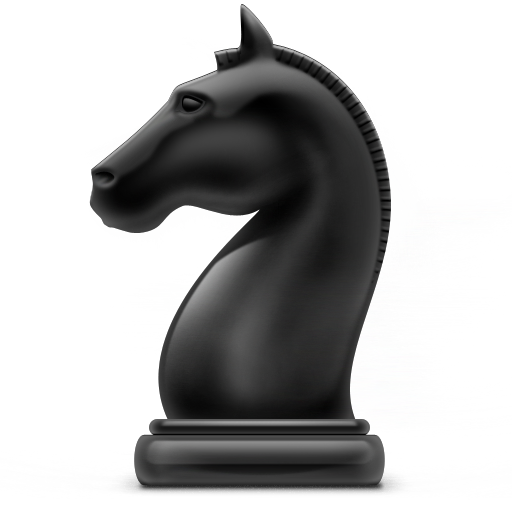 MAY 9 North Arlington Chess Club Open #2 G/40;d5 - Our tournament, so bring a friend. May 16 Many Springs 75 G/60;d5 - For experienced players. Dallas Chess Club has several tournaments each week. The best young players and masters in DFW play regularly. Catherine won a medal and a trophy at the DFW All Boys/All Girls Championships on Saturday. One was for best dressed in pink, the other for a positive score in the girl's open section. NACC Open #2 Tournament Flyer. If you are receiving this announcement, it is because through our extensive research of documents and records your name has been found in association either past or present with Boy Scout of America - Troop 68 of Arlington, Texas. We are excited to announce that on Saturday April 18th we will be celebrating the 85 years of scouting that Troop 68 has brought the youth of Arlington. All of us have our memories, stories of great adventures, and pictures of our time growing up in Troop 68. This will be a great opportunity for us too share those adventures and once again see everyone that we grew up with in the Troop. A tentative schedule of events are listed below, more details will follow as we get closer to the event. 9am Event Setup for Door Greeting, Patrol Demonstrations, and Activities. 11am Reunion Kick-off, Door Prizes, Demonstrations, & Tours. 12pm until? BBQ Lunch, Awards Program, Story Telling, and other related activities. This message will be going out as an email, snail mail, and on Facebook, so if you get it twice it just makes it easier to share. If you know of any other former Scouts, Brothers, Fathers, Sons, Nephews, Uncles, or Grandfathers of the Troop, please pass this announcement along, as we may have missed them. I hope to see you there! If you have any stories, old photos or newspaper articles of bye gone events, please bring them early Saturday morning to share with everyone. As many if you know we collect Boy Scout memorabilia, and we plan on bringing out a variety of items to display, from all aspects of scouting history, so please feel free to bring any of your own items to show them off (just make sure to label them). We will have many tables out to reserve spaces for your albums, awards, photographs, or TV/monitors/laptops to display your slide shows. We will need a head count to prepare for the BBQ, or it may just be served until it's gone, so please email us at troop68arlington@gmail.com or give us a call@ 214-274-5676.
Who is up for a Philmont trek? leaving Saturday July 18th and returning Sunday August 2nd. Basically the last two weeks in July. I believe it is 4 slots, at least one needs to be an adult. or you can contact me and I will get you in touch with him.. Please share this email with as many Cub Scout leaders as possible!! The registration link is up and open for BALOO!! 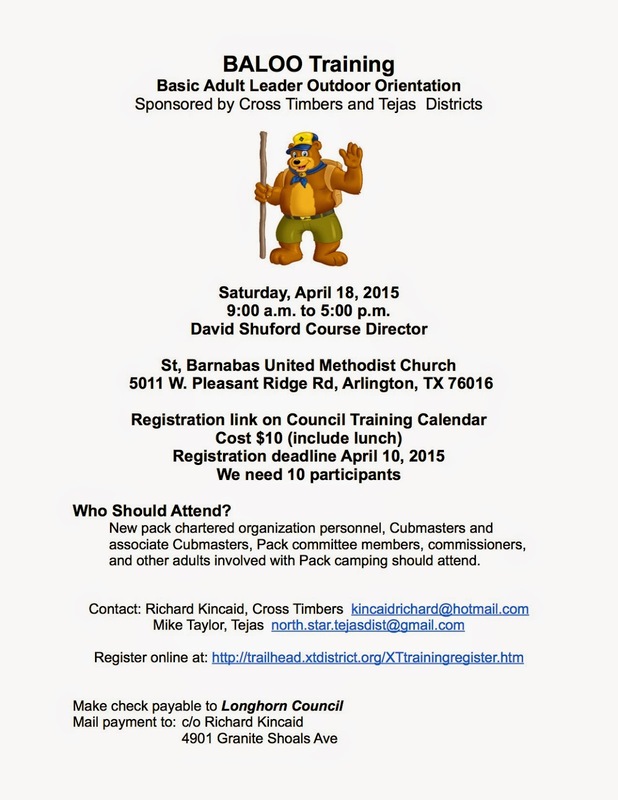 First….we need Cub Scout leaders to attend this BALOO training and become trained!! Encourage them to register !!! See the attached flyer. ALSO…..There will be a Live YPT Class at 8AM, before the BALOO course. Second….I am looking for scout leaders that would volunteer to join the staff for this BALOO training, and teach a segment of it! Anyone else that could come help us…..please!! Just let me know!! I have a complete handbook on BALOO training and agendas. THX!!!! A Troop in Coppell is looking for 4 Scouts who are interested in a Philmont Scout Ranch Cavalcade program this summer. If you have Scouts interested in joining them, send a note to dromack@tx.rr.com and I will connect you with them. Additionally, there is a Sea-base for this summer and another Philmont trek with openings this year. As well as a Philmont trek for next year. If you are interested please post to this blog entry. Last week we were disheartened to learn that Boy Scout Troop 444 of Littleton, CO had a trailer and camping gear worth $25,000 stolen from, of all places, a church parking lot. So Kelty did something about it and donated $25,000 of camping and outdoor gear to the troop. Kelty has been around for over 60 years. Countless Boy Scouts have used our products over the years, and many of these great people have subsequently turned into lifelong Kelty customers. In all, it was a no-brainer for us to help an organization that has such long and rich traditions in the great outdoors. If you feel compelled to keep the Kelty spirit going and donate to Boy Scout Troop 444, you can do so here. This message was sent to robert@blakejr.com. If you no longer wish to receive messages from Kelty.com, you may unsubscribe.